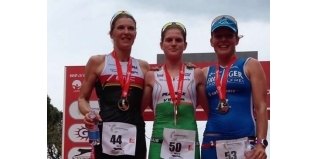 Ireland's Eimear Mullan followed up her second place at Challenge Fuerteventura recently by taking the top spot on the podium today at Challenge Rimini in Italy. There was also a podium finish for the current Ironman 70.3 European Champion, Ritchie Nicholls, who took third place. Though much improved in the water over the last 18 months, in typical style Mullan had to chase once on dry land after losing three minutes to the swim pacesetters which included multiple iron-distance champion Gina Crawford (NZL). Once on two wheels she was able to catch and pass everyone ahead of her, with the exception of Belgium's Tine Deckers, who reached T2 with almost two minutes lead. Mullan is strong on the bike, but perhaps even better on the run however and her 1:22:58 was comfortably the best of the day and took her to victory almost three minutes clear of the multiple Ironman France winner. In her first race over the distance, Great Britain's Vanessa Raw finished sixth. "Great race and an amzing experience in Italy" said Mullan after the race. In the men's race, Italy's Domenica Passuello may have lost three minutes in the water to the 'fish' in front, including athletes of the calibre of Bart Colpaert (BEL), Terenzo Bozzone (NZL) and Nils Frommhold (GER), but just as he did recently at the Triathlon de Elche, a crushing bike ride - along with a fastest run split too - brought the Italian home to a dominating win over four minutes clear of the field, with Andreas Giglmayr second and Nicholls third.